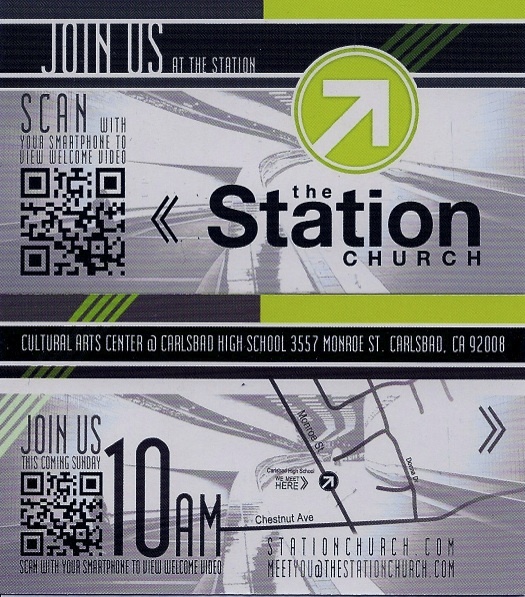 I announced last month here on my blog that I was joining the lead team at The Station Church in Carlsbad, CA. This week was what we called our Launch Sunday as we jump into holding weekly worship experiences. We sent out mailers to thousands of homes in the community surrounding the venue where we’re meeting. We invited friends and neighbors and just about anyone who would let us hand them an invitation card. And we prayed. Saturday night we held our first load-in and tech rehearsal at the Cultural Arts Center at Carlsbad High School. The CAC, as we affectionately call it, is a 400 seat performing arts theater. An incredible venue and local landmark for us to meet in. We were there for 6 hours getting everything dialed in and ready for our inaugural worship experience. Sunday morning we ran through everything and fine-tuned details and then we opened the doors. A slow and steady stream of people began to arrive. It was definitely exciting. There was an air of expectancy as people made their way to the CAC, checked children into The Kids Station and took their seats in the theater. It was incredible! There were about 130 adults in the main room and 20 in the kids ministry. As we led worship something beautiful happened, people were singing out and worshiping God together in a way that many churches never see after meeting together for years. It was quite moving. The band did a rocking job and our tech team was spot on…I couldn’t have been prouder of our team. Our Lead Pastor, Josh Nelson had a great teaching on relationships as we started a series called ‘Mr. & Mrs. Betterhalf.’ The most AMAZING part of the day was this…Josh gave everyone there an opportunity to put their faith in Jesus as Savior…10 people made decisions for Christ!!!!! It was terrifically energizing for everyone on our team to witness 10 people crossing over from death to life. These moments have eternal significance and are exactly why we are starting this church. I can’t wait to see what God is going to do next. If you’re in the San Diego area we would love to have you join us. We meet at 10:00 AM every Sunday. What stories do you have from serving in a brand new church?